The First Coast Expressway (FCE, SR 23) is a multi-lane, limited access toll road that, once completed, will cross parts of Duval, Clay and St. Johns counties. Expressway traffic will pass through electronic toll gantries without stopping. The gantries will contain an electronic system that will either detect the vehicle's SunPass transponder device or scan the vehicle's license plate for a toll-by-plate invoice in the mail. The total length of the proposed roadway is approximately 46 miles. The FCE will reduce congestion on other major roadways in the region, important not only for daily commuters but also critically important during times of storm-related evacuation. Toll collection on the First Coast Expressway will begin Spring or Summer 2019. Below are the list of individual projects. Click to learn more. 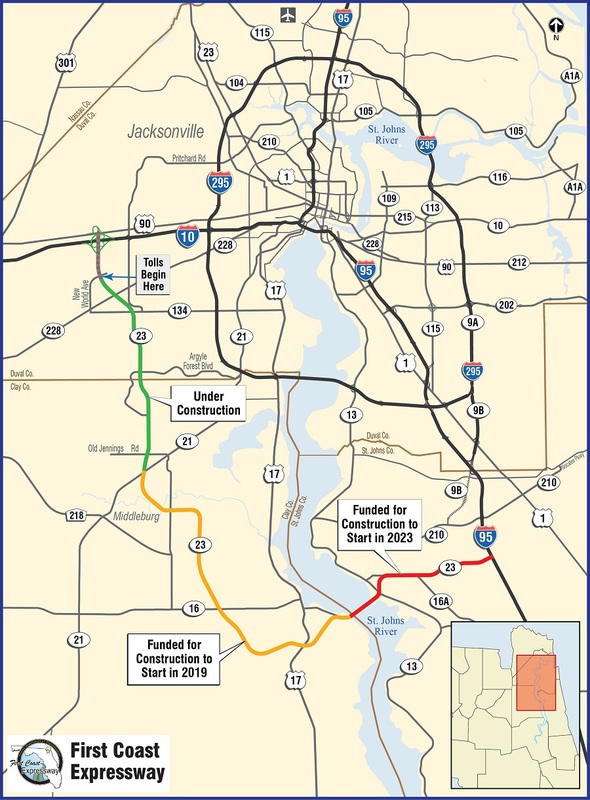 Construction on the northwestern, first segment of the FCE (Blanding Boulevard/SR 21 in Clay County north to I-10/US 90 in Duval County) began in 2013 and should be completed in its entirety in early 2019, with tolling set to begin early 2019. Pictured here in green, this FCE segment is comprised of three projects currently under construction: US 90 (Beaver Street) Extension, I-10 to Argyle Forest, and Argyle Forest to SR 21. The combined construction cost of these three initial FCE projects is approximately $208 million. The central, second segment of the FCE project involves new roadway from Blanding Boulevard/SR 21 in Middleburg running south and then east through Green Cove Springs and includes a new bridge over Black Creek near the Byron Road/Lake Asbury community. This segment is shown in yellow on the map. The north project, which runs from north of SR 16 to north of SR 21, will be built by Sacyr Construction at a cost of $230 million. Construction is expected to begin in March 2019 and be completed in 2025, weather and schedule permitting. The south project, which runs from east of CR 209 to north of SR 16, will be built by Superior Construction at a cost of $180 million. Construction is expected to begin in April 2019 and be completed in 2026, weather and schedule permitting. 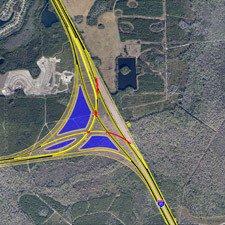 The southeastern, third segment of the FCE (new bridge over the St. Johns River where Shands Bridge currently stands and connection to I-95 in St. Johns County) is expected to begin construction in 2023 at a cost of $763 million (see red shaded area on map). The new bridge over the St. Johns River will increase vertical clearance to 65 feet from the current 45 feet to accommodate additional shipping traffic. To view details related to the exact route of this third segment and others, please refer to the PIM Maps found on the Documents & Publications page of this website. A limited access highway only allows the public and motorist access to the roadway at interchanges with entrance and exit ramps. What portion of the roadway will be tolled? Signs stating Future Toll Road SR 23 have been placed on SR 23 (Branan Field-Chaffee Road / Cecil Commerce Center Parkway) to inform the public of the Florida Department of Transportation's (FDOT) plans to toll this section of roadway in the future. This roadway is part of a planned larger expressway project known as the First Coast Expressway (FCE). The FCE will be a toll facility from I-95 in St. Johns County to I-10 in Duval County. The mainline of the FCE will be tolled; however, the existing road from SR 21 to Oakleaf Plantation Parkway will become a non-tolled frontage road. Tolling this new facility will allow the project to be built much sooner. When will tolls start being collected? Toll collection will begin Spring or Summer 2019. Won't tolls cause Congestion? Will I have to stop to pay a toll? The Toll-23 (first portion of the First Coast Expressway) corridor will not have conventional toll collection plazas. There will be no stopping or slowing to pay tolls. All toll collection will be electronic, using the state's prepaid SunPass service or a license plate photo option called TOLL-BY-PLATE. SunPass reader equipment will be mounted overhead on structures spanning over the highway lanes. There will be one of these automated tolling facilities between each pair of interchange access points. For those vehicles equipped with SunPass, their toll amount will be automatically deducted from their prepaid account when they pass under the SunPass reader equipment at normal highway speeds. For vehicles without SunPass, special camera equipment on the overhead gantries will record a photo of the license plate and a monthly invoice will be sent to the registered owner of the vehicle, including a $2.50 monthly administration fee. What will the toll be? Under what circumstances could these toll rates be raised? Toll rates will be adjusted annually for inflation, using the Consumer Price Index. This is in keeping with a 2007 law passed by the Florida Legislature. Can I get a discount on the toll if I am a frequent traveler? At present, there is no plan for a frequent user discount. However, SunPass toll rates will be approximately 25 percent lower than TOLL-BY-PLATE. What are the free routes which motorists can use to avoid paying tolls? Branan Field Road, OakLeaf Plantation Parkway, Old Middleburg Road, Chaffee Road and I-295 will all remain as free parallel north/south corridors. Once tolls are in place, the trip from I-10 to New World Avenue and reverse will be toll free. This allows access to Cecil Commerce Center from I-10 without paying a toll. Also, between Old Jennings Road and Oakleaf Plantation Parkway, frontage roads have been constructed to maintain local access. These frontage roads are not tolled. Where is the money coming from to build this road? The entire project, except the frontage roads, will be funded by the Florida Turnpike Enterprise. How does the toll bonding/construction cost funding system work? The Florida Turnpike Enterprise borrows money with the toll revenues from this project as well as the entire Turnpike system as collateral for repayment of the debt. Due to Florida Turnpike Enterprise's excellent record of delivering toll projects, the interest rate on the debt is very low. Toll collection will begin early 2019.